Since my last post, life has gotten significantly more busy – who knew that was even possible? I have two big final presentations coming up next Tuesday, and two the following week as well, and as many seniors in the senior class, myself and my fellow teammates seem to be finding it hard to produce any real work. So a week before these big presentation, we decide it’s just about time to get started, then run around like chickens with our heads cut off because we started too late. Thank goodness there’s only two weeks left of this insanity. But anyway, there is a point! My crazy schedule made it nearly impossible for me to attend a blogger meet-up I’d been planning to attend on Tuesday night, so I decided that if I was missing that one, I would absolutely make cupcakes for Cupcake Camp Boston, and bring them to share. 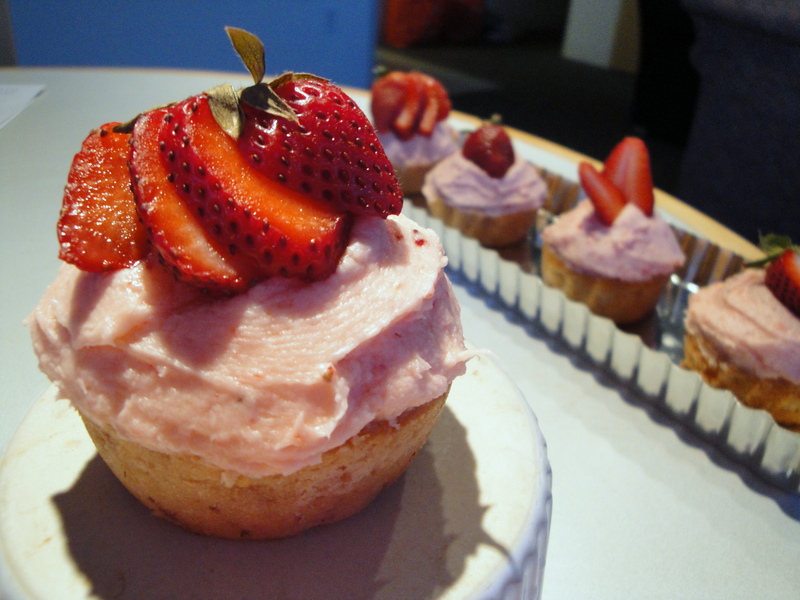 So I threw together a batch of strawberry cupcakes, using a recipe I came across on numerous times during my search, and they turned out beautifully. I wrapped them up tight and left them to wait for their frosting and final touches. I figured substituting the Cupcake Camp gathering for the BakeSpace blogger meet-up would be perfect — until I realized I’d registered my cupcakes too late, and they wouldn’t be accepted. So I had 18 cupcakes sitting there, naked, waiting for something to happen. How sad they seemed –I contemplated bringing them anyway, and hoping that someone would let me in, but then I decided they’d be much better appreciated at home with my roommates. So here they stayed! 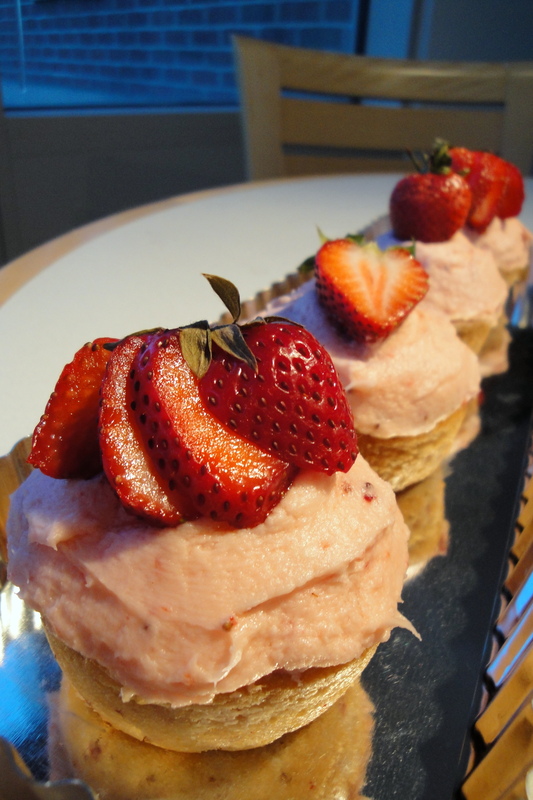 I got the recipe, called Sprinkles’ Strawberry Cupcakes from Martha Stewart’s Website, but it is originally from Candace Nelson. I don’t have a food processor here, so I happily “pureed” the strawberries with a knife and some elbow grease — it’s more authentic that way, right? It was a pretty easy recipe to throw together, and the cupcakes cook perfectly — they come out being the perfect shape and size, and so adorable. 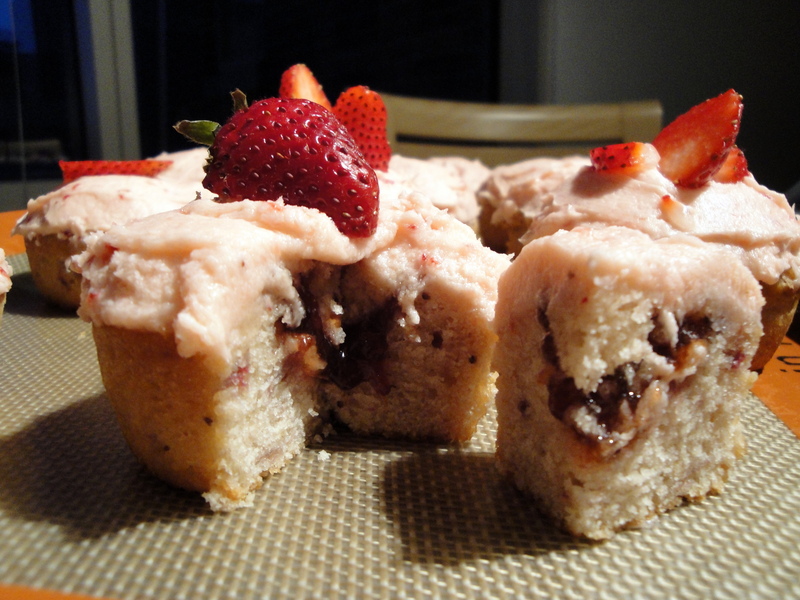 These guys were so yummy, and with the fresh strawberries on top (and jam oozing out of the centers), so pretty too. A lovely spring treat, and I have to say I’m thrilled that they didn’t get shipped off to Cupcake Camp, though I am sad to have missed it, because they are just too good to give away. It’s time to get back to the real world now — no more playing with food, but this was a fun one! I spent a solid 1 1/2 hours in the kitchen with my roommate (who was baking carrot cake) this evening, just putzing around and being silly baking fools. What a wonderful way to pass the time. With love, and (strawberry) sugar. Enjoy!